Garrett/KKK Turbochargers which are the most popular and reliable turbos around today. They come with special designed Turbo Exhaust Manifold with heat-shields for reliability and keep the turbo heat away. 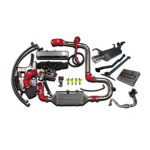 Turbo Kits are supplied with aluminium Alloy High Flow Intercooler for front mounted to give maximum cooling efficiency. All Turbo Pipes are stainless steel and mandrel bent with Silicone Hoses (heat-resistant) to suit. All Turbo Kits are Dyno Tuned (in-house 4WD Dyno) for all fuel and ignition cells map extensively and tested with many hours on all road conditions to ensure the Turbo ECU Map can run without any hitches. All Speedworks Turbo Kits are tuned with 0.5 to 0.7 Bar Boost using only RON 95 Petrol without any adverse effects to all standard engine parts. Power increases are about 50% in BHP and torque. NB: We got 90% BHP Increase on the Perodua Viva! 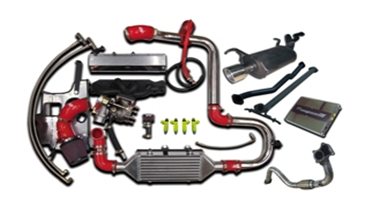 Complete Turbo Kit with Full Exhaust System, Intercooler, ECU, Injector & a Tuned Map. Engine Oil cooler kit ..